Balanced technology provides consistent performance at all tank pressures, at any depth and optimizes the second stage performance, for effortless breathing. Dry ambient pressure chamber provides better protection and performance in cold water than any other diaphragm regulator. Balanced diaphragm design, with ultra-fast flow to the second stage, prevents water entry, enhancing trouble-free operation, even in the coldest or most polluted conditions. Finned cap with ribs acts as a radiator to increase the surface area of heat transfer form the water to warm the internal parts. Air balanced valve technology decreases the inhalation resistance to the lowest possible level resulting in super smooth breathing. 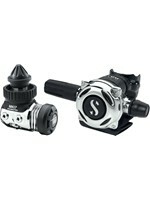 Diver adjustable inhalation effort with micrometric adjustment knob enables personalised breathing effort control. Newly aligned VIVA system for more precise control and comfort. Super high flow exhaust valve allows air to exit more freely and lowers the exhalation effort; also keeps bubbles away from face and mask.